Overall I find the AmpliTube Fender collection to be very close to the original gear modeled. Highly recommended for its clean, semi driven sounds and vintage sounds. I believe a lot of studios will supplement their plug-ins with this package as natural clean on point of breakup blues tone has been something engineers have been looking for in a plug-in for quite some time. 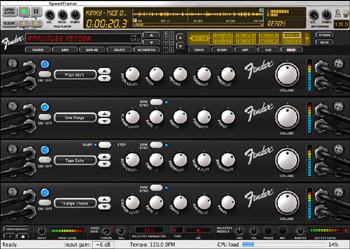 In this release IK Multimedia partnered with Fender to model their amp, effect, cab and mic line. I remember the official announcement regarding this product and just as many other recording musicians, I have been anxiously waiting to hear the results. According to Shane Nicholas, Senior Marketing Manager, Fender® Guitar Amplifiers, Fender "...made countless suggestions, changes, and tonal tweaks in the same way that we do when we develop the real amps, and many of the same people were involved.". Davide Barbi, head of development explains that IK went to great length to ensure that according to both IK and Fender, the modelers were as close to the real thing as humanly possible. So what does the IK AmpliTube Fender contain? 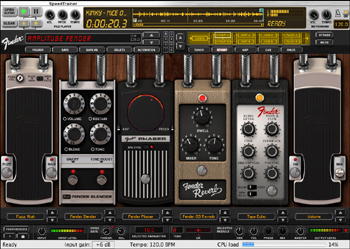 Like AmpliTube 2 ( reviewed earlier on 5/28/09), The Fender and other AmpliTube packages (Ampeg SVX, AmpliTube Jimi Hendrix, AmpliTube Metal and AmpliTube 2 Live) contain the familiar 5 module layout and a standalone version with SpeedTrainer. The AmpliTube X-GEAR and StompIO provides seamless integration with other products of the range, thus letting you mix and match parts from all the rigs available. Registration for the software was a breeze as I had already created an account with IK Multimedia. For those that do not have it, it requires you to register and then enables your software via a challenge/response validation routine. The whole thing took less than a few minutes and I was good to go. IK knows that some studio engineers prefer to keep their machines off the web for safety so they also took into account remote validation where you can register via another machine. The software installs a standalone version and a vst/au/rtas plugin version in your default plug-in folder (location can be changed if desired) for use with your DAW app of choice. In my case I tested it with Cubase 4. Without any tweaks I achieved 4ms of latency which was virtually seamless and I could start using it off the bat. The latency results will vary on different systems and on the load that is put on the host, thus I would usually recommend interested users to check the hardware requirements and download the trial version before purchase, so they can be sure the software runs smoothly on their recording computer. I'd have to say that there are plenty of models - everything that is included sounds realistic and has its uses, depending on the styles and musical approach needed. As far as sound, I have somewhat limited experience with vintage Fender gear so I am not sure how close exactly they've gotten to some of these amps. The ones that I am familiar with - the Bassman, the Champ and Blues Jr. (similar to the Pro Junior) I'd have to say are very close. The models respond and play like the real thing and behave very naturally along their whole spectrum of sounds. The Bassman sound is just as I remember it - fluid, deep and sparkling. the Champ and Pro Junior are clean when played soft and barky and semi driven when hit harder. I've recorded a few bands with the MH-500 Metalhead and although I didn't particularly like that amp then as I found it grating and lifeless, I'd have to say that IK modeled it perfectly, as it has the same sound and response as the original. I've played and recorded a few Fender Twin Reverb Reissues and as far as I can tell these models are also amazingly close to the real thing. The Twin Reverb patch is just as lush as the original, with some great presence and chime. What I found to be truly amazing and I haven't discovered much in hardware and software modelers that I've played previously, is the fact that these amps do great in-between tones. The ones I am referring to are the "British Invasion" and early Rock'n'Roll sound where the amps are clean but on the verge of breakup. The IK Fender series nails these sounds and they do it beautifully without any artifacts which I've found in other competing products. If you're after the Beatles, Buddy Holly, Little Richard, Elvis and other great rock guitar tones - they 're here and are available at the touch of a button. If you want Eric Clapton and Pink Floyd sounds - they're all here as well. The AmpliTube Fender collection excels in blues, classic rock, psychedelia, jazz, funk and traditional rock sounds. It also provides some great bass patches courtesy of the Bassman, TBP-1 bass pre-amp and the Bassman 300 amp model. I found the metal and hard rock section severely lacking, not that it is any great surprise as Fender are really not well known for raging gain tones. The only useful amp in the high gain range being the Super-Sonic™, which on its own and some help from compression and fuzz effects delivers some smooth lead tones and mild hard rock/hair metal crunch, but nothing that would be my first choice for a metal sound. The MH-500 modeler dials in some nu-metal tones and handles low tuned guitars well but it does seem to lack presence and again won't be my first pick for metal rhythm, although it could do really well on an industrial song. The effects in this pack, although limited, are quite good. I've always loved Fender's reverb and echoes and not just on guitars, so these models are quite useful on other sources as well. Lacking from this pack was an useful overdrive and eq pre-amp effect. I often wished for a tool to push the tubes further and bring some different tonality, like for example the SRV trick of throwing a Tubescreamer pedal in front of a clean Fender amp for some extra sustain and grit. In this pack there is a fuzz pedal that was a bit nasal sounding for that use but provided some nice lead tones. 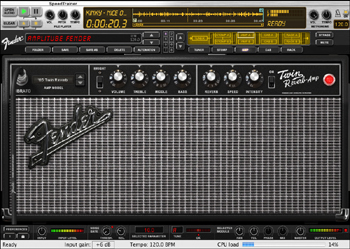 The AmpliTube Fender excels in mic models, such as the GT MD1b-FET, GT VELO-8 and Ribbon-160, probably thanks to the Fender acquisition of Groove Tubes. There is also a wide selection of Fender cabs, with one especially notable - the Vibratone 1x10” Rotary Speaker, which is close to a Leslie in sound. 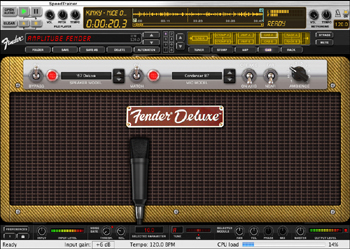 As luck would have it, this version is compatible with AmpliTube 2, as are other AmpliTube versions such as the Ampeg SVX, AmpliTube Jimi Hendrix, AmpliTube Metal and AmpliTube 2 Live, and can be stacked together via the AmpliTube X-GEAR software (part of package) so all effects, amps, cabs, mics and rack effects are available and joined in one common interface. I found this to be very useful as the whole collection integrated seamlessly, so I could use Fender echo on a Marshall lead patch and so on.